Online booking for our range of indulgent treatments is now available, log in to check out our range of offers! Treat yourself with our range of massages, facials, body, hand and foot treatments or simply relax in our range of Mediterranean themed features. Aqua Springs spa is a fantastic way to spend a day either on your own or with a group of friends enjoying the tranquil setting. Indulge in our jacuzzis, monsoon shower, saunas, steam, salt inhalation and aromatherapy rooms. Open to non-members on a pay-as-you-go basis. 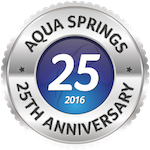 Minimum age for entry to Aqua Springs is 16 years. Spa Day packages are available, along with Beauty Therapy treatments by pre-booking on 01206 282100. Afternoon teas now also available for pre-booking.